We’ve already hit Warsaw, Bratislava and Prague for our Spring 2015 festival season, and our final stop in Cologne is now sold out. 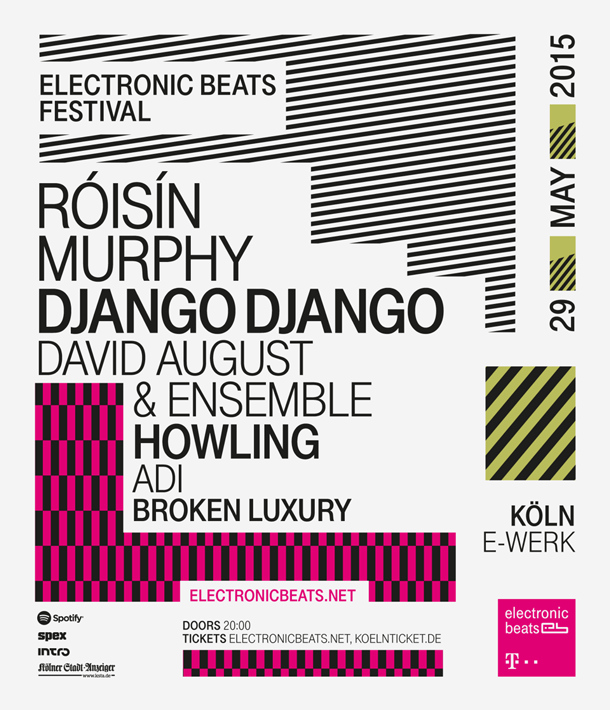 On May 29, Scottish four-man unit Django Django will take the E-Werk stage alongside Howling (the duo comprised of Ry Cuming and Frank Wiedemann of Âme), Moloko diva Roísín Murphy and three special guests: David August, who will play with his live ensemble, Israeli pop songwriter ADI and Broken Luxury. Stay tuned for opportunities to win tickets. We’re also partnering with LeafAudio for a build-your-own drum-machine workshop, where participants learn to construct their own “noise to brain adaptor” mini-synth; full details and registration here. Django Django made waves with the release of their eponymous debut album in 2012, which was shortlisted for the Mercury Prize and named one of the top albums of 2012 by Rolling Stone and NME. The Scottish four-piece consists of producer and drummer Dave Maclean, singer and guitarist Vincent Neff, bassist Jimmy Dixon, and synth player Tommy Grace. They’ll appear at EB Festival in Cologne right after the release of their follow-up record Born Under Saturn, which promises trademark pop psychedelics and earworm melodies. The collaboration between Australian-born, LA-based singer-songwriter Ry Cuming (a.k.a. RY X) and Frank Wiedemann of the Innervisions-affiliated electronic pair Âme turned out to be one of 2012’s most inspired efforts. Their eponymous debut single “Howling”—a beguiling combination of electronic percussion and melancholic, folksy melody—instantly achieved the status of much-loved cult classic. Róisín Murphy‘s first album in eight years, Hairless Toys, is set to arrive this spring. Influenced by cult documentary Paris is Burning and dedicated in part to the “outcasts who could never fit into mainstream society,” the ex-Moloko member will debut new material from the album in her upcoming live appearances, but she’ll also draw songs from her deep back catalog. Our surprise addition to the link is David August, a Hamburg-bred musician who moved to Berlin. He has pursued a pretty impressive and successful career as a tech-house producer, and since his debut on the legendary Diynamic label in 2010, he’s become one of the outpost’s mainstays and crown jewels. He’ll join us in Cologne with his multistylistic improvisational quartet to perform live reinterpretations of his music, which consists of Max Trieder (Guitar), Sissi Rada (Harp + Vocals), Marcel Braun (Drums + Percussion). And finally, with our previous spring festivals in Warsaw, Bratislava and Prague, TMTS golden girl ADI is booked to open the festivities in Cologne. The singer/songwriter/producer’s style is a versatile, multi-genre take on pop, rap, and electronic music. Click here to read our interview with the Israeli native in which she discusses her desire to enact change in the country, and check out our in-depth feature on Tel Aviv and the cultural boycott here.